Rahla Rahat is an Assistant Professor of Sociology at the Institute of Social and Cultural Studies. She has a MA in Sociology from the University of New Brunswick, Canada. She is currently pursuing her Ph. D. from University of the Punjab. Her research and teaching interest includes gender, development, resettlement, and urbanization. 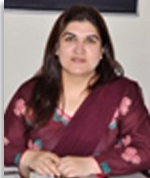 Rahat works with various national and international organizations as consultant and trainer including the World Bank, Population Council, British Council, and WAPDA.